In southwestern Vermont, the recently-discovered contamination of private drinking wells is now the top priority of the state's environmental conservation department. Many residents of North Bennington are drinking bottled water, after private wells here tested positive for a potentially harmful chemical. "I grew up in North Bennington, and a lot of my friends and family are on [well water], so it worries me," said Bronwen Mulligan, who works in North Bennington. The substance, known as PFOA, is believed to have come from the former ChemFab facility, which closed more than a decade ago. That plant treated industrial fabrics with chemicals to create special surfaces. Man Hospitalized After Being Shot in Vt. Since the discovery of PFOA in several private wells close to the plant, more than 135 other private wells in a 1.5-mile radius around the factory have been tested. Additional testing is underway, state officials said, not just on private wells, but soon, on rivers, fish, and residents' blood. 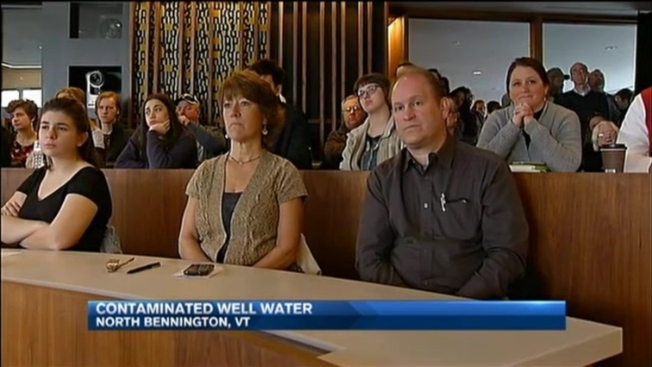 "We're just anxious to get the results back from the well testing, and we're grateful people have been moving so quickly," said Darcy Oakes of Bennington, one of several dozen people in the vicinity of the plant who attended a public meeting Tuesday at Bennington College. At the meeting, health and environmental officials warned people and pets not to drink their well water until test results come in, saying PFOA has been linked to low birth weight, high blood pressure, thyroid disease, and certain types of cancers. "We do not see any statistical increase in cancers in this area," said Tracy Dolan, a deputy commissioner with the Vermont Department of Health, noting that kidney and testicular cancers have been linked to regular PFOA exposure elsewhere. Earlier Tuesday morning, Gov. Peter Shumlin, D-Vermont, toured North Bennington, speaking with well owners near the factory, like landscaper Ron Pembroke. "It leaves everything up in the air," Pembroke said, describing the uncertainty contaminated well water has on his land use plans. Shumlin said one of the leading ideas of how to get out of this mess is to switch homeowners who use private wells over to the municipal water supply. It would take running new pipes and other equipment, but that municipal water supply is safe, Shumlin said. "My message is simple," Shumlin told the crowd at the public meeting. "We're in this together. We wish we weren't. We're going to require the company to make us whole again, and do everything that we can to hold them accountable for getting us into this mess." Already, the plant's owners, Saint Gobain, are paying for the bottled water and tests to the wells, Shumlin's office said. An informational call line for residents concerned about PFOA contamination will be available on an ongoing basis, from Monday to Friday, 8 a.m. to 4:30 p.m., at 802-828-1038, according to the governor's office. Vermont Health Department staff members have reached out to each home that has had PFOA detections and are available to talk with anyone with questions about potential health effects of PFOA at 800-439-8550, Shumlin's office wrote in a news release. Information about potential health impacts of PFOA can be found on the Health Department's website. Last week, consumer advocate Erin Brockovich and a law firm announced they're adding the Vermont community to places they are investigating in connection with contamination from PFOA, the Associated Press reported. Brockovich said North Bennington is the latest in a long line of communities where people can no longer trust their water, the AP wrote, which she called the most basic necessity of life. She said she hopes the investigation will help residents understand more about the size and scale of the problem.